Corundum™ Text includes alternate forms of C, G, and S.
Corundum™ Text includes the archaic “long s”. Corundum Text Italic includes three forms of lowercase z: standard, short, and long. Alternate forms of figure one and figure seven are provided in Corundum™ Text Italic for parity with Corundum™ Text Roman. Corundum™ Text Roman includes an alternate flat-seriffed ampersand. Corundum™ Text Italic includes two alternate ampersands. The small capitals fonts include special versions of the ampersand. 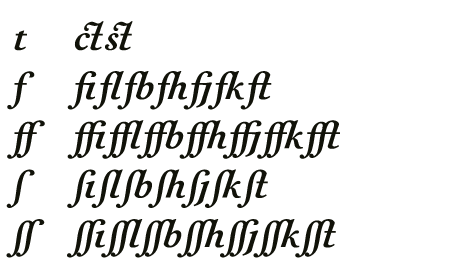 Corundum™ Text includes 32 ligatures for each Roman and Italic, comprising t, f, ff, long s, and double long s pairings. Corundum™ Text’s small capitals fonts include special versions of the parentheses, brackets and braces. Corundum™ Text Pi includes more than 100 marks, arrows, and symbols, as follows. For a full character map of Corundum™ Text Pi, please see the Corundum™ Text PDF specimen. Designed by Joshua Darden. Production assistance by Noam Berg, David Fusilier, Thomas Jockin, Scott Kellum, Lisette Kelmanson, Lucas Sharp, and Eben Sorkin. In the late 18th century, baroque flourishes gradually gave way to stark rationalism. This period saw some of the greatest practitioners of the balance of beauty and function, among them Pierre-Simon Fournier. Expanding upon the utility of Fournier’s designs for prose and poetry, Corundum Text includes two heavier weights, each with a fully-equipped arsenal of italics and small capitals, suitable for subtle, immersive text settings or robust display with a literary touch. Based on the middle sizes of Fournier’s body of work, Corundum Text’s generous capitals and strong color on the page mark it unequivocally as a text face in the Neoclassic style: when stripped of its letterpress veneer, a quiet, crisp brilliance emerges. The italics demand special attention in this regard: hailed by historian Harry Carter as ‘the most legible … of all’, they were among the first to merge the undulous line of handwritten Italics with the broken strokes of the roman, an innovation which is now a standard practice in the design of typefaces for legibility.